I lust after these nail colors! I always love a nice light color for everyday, or with some sparkle for more festive occasions. Of course, ruby red is always a classic. If you're fair, like me, the aubergine color would be a great wearable alternative to the black nail trend. You can still go dark, but have a bit of beautiful color to your nails. 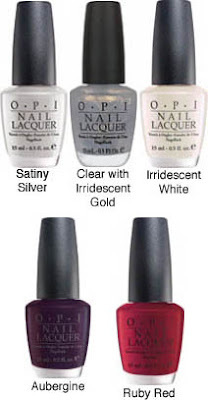 If you want to go black, OPI has several beautiful blacks that you can wear.